The discovery of wonder material graphene was awarded the Nobel Prize in Physics in 2010. The material contains a layer of carbon atoms set in a honeycomb lattice. However, the study of graphene did not stop at this point. New fascinating properties of graphene are still being discovered. Now, an international group of scientists have described the strange behavior of electrons passing through thin constrictions in a layer of graphene. These findings have been published in the Nature Communications journal. "When electrical current flows through graphene, we should not imagine the electrons as little balls rolling through the material", says Florian Libisch from TU Wien (Vienna), who headed the theoretical part of the study. The electrons move via the graphene as a long wave front, and their wavelength can be many times larger than the space existing between two adjoining carbon atoms. "The electron is not confined to one particular carbon atom, in some sense it is located everywhere at the same time", says Libisch. The team analyzed the electrons behavior while squeezing through a thin constriction inside a sheet of graphene. The wider the constriction, the larger the electron flux - but as it turns out, the relationship between the width of the constriction, the energy of the electrons and the electric current is quite complex. When we make the constriction wider, the electric current does not increase gradually, it jumps at certain points. This is a clear indication of quantum effects. If the electron’s wavelength is large enough that it does not fit in the constriction, the electron flux is very less. "When the energy of the electron is increased, its wavelength decreases", explains Libisch. "At some point, one wavelength fits through the constriction, then two wavelengths, then three - this way the electron flux increases in characteristic steps." The electric current is quantized and is not a continuous quantity. This effect could also be found in other materials. Identifying it in graphene was very hard, as its complex electronic properties result in a huge amount of other effects, interfering among one another. The experiments were conducted at the RWTH Aachen (Germany) by the team of Christoph Stampfer, and computer simulations and theoretical calculations were conducted by Larisa Chizhova and Florian Libisch at the team of Joachim Burgdörfer in Vienna. The graphene sheets had to be carved into shape with nanometer accuracy for the experiments. "Protecting the graphene layer by sandwiching it between atomic layers of hexagonal boron nitride is critical for demonstrating the quantized nature of current in graphene" says Christoph Stampfer. Current passing through the devices is next determined at very low temperatures. We use liquid helium to cool our samples, otherwise the fragile quantum effects are washed out by thermal fluctuations. Simulating the experiment has just as much difficulty. "A freely moving electron in the graphene sheet can occupy as many quantum states as there are carbon atoms", says Florian Libisch, "more than ten million, in our case." This makes the calculations very tough. A single electron within a hydrogen atom could be explained using just a small number of quantum states. 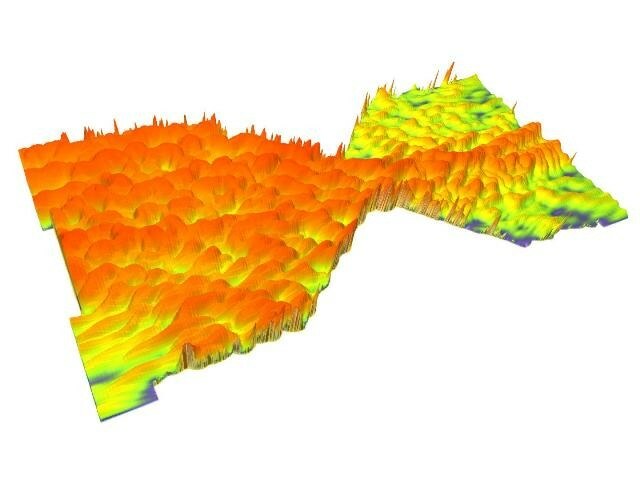 The group at TU Wien (Vienna) created a computer simulation on a large scale and measured the electrons behavior in graphene on the Vienna Scientific Cluster VSC, by making use of hundreds of processor cores in parallel. It was found that the graphene sheet’s edge plays an important role. "As the atoms are arranged in a hexagonal pattern, the edge can never be a completely straight line. On an atomic scale, the edge is always jagged", says Florian Libisch. The electrons could reside in unique edge states, which have a significant control on the electronic properties of the material in these regions. Only with large scale computer simulations using the most powerful scientific computer clusters available today, we can find out how these edge states affect the electrical current. The excellent agreement between the experimental results and our theoretical calculations shows that we have been very successful. Graphene discovery opened the door to a new domain of research: ultrathin materials that only contain very few atomic layers are drawing a great deal of interest. Particularly, the mix of graphene and other types of materials - like boron nitride, similar to this case - is expected to give attractive results. "One thing is for sure: whoever wants to understand tomorrow's electronics has to know a lot about quantum physics", says Florian Libisch.